Today’s preview brings us to the top office of the Highest Anti-Terrorism Effort, or H.A.T.E., and to its commander-in-chief Dirk Anger! 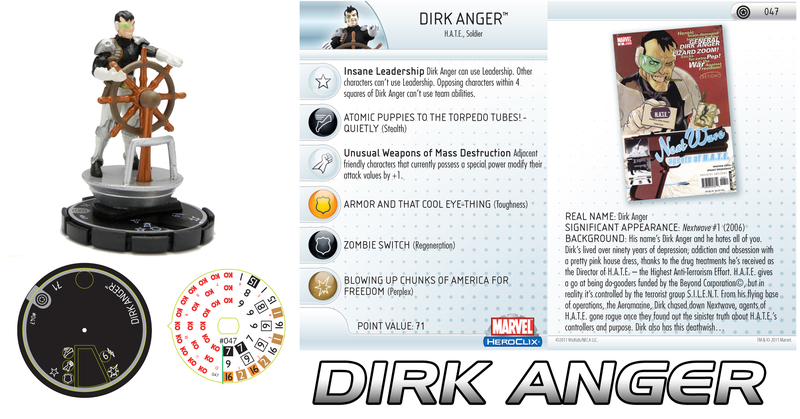 At 71 points Dirk Anger brings some interesting and useful abilities to any force. His dial starts off with Stealth as he issues orders from the shadows of H.A.T.E.’s Aeromarine command ship. Dirk’s penchant for wearing his favorite pink dress and utilizing unconventional weaponry is represented by Perplex, while his custom-made armor allows for some measure of protection from attacks in the form of Toughness. In addition to the helping hand Perplex can lend, Dirk Anger’s Unusual Weapons of Mass Destruction special power also enhances your adjacent friendly figures by providing a +1 bonus to their attack values if they possess a special power themselves! As he has endured much over his ninety years, Dirk Anger’s resilience is represented by Regenerate. Whether it be dealing with agents gone AWOL (like Nextwave!) or his own deathwish, Dirk Anger is ready to do battle! That’s not all! We could scarcely offer Dirk Anger without also including a sneak peek at his zombie variant! No Nextwave/H.A.T.E. collection could be considered complete without a “Successful” Dirk Anger! 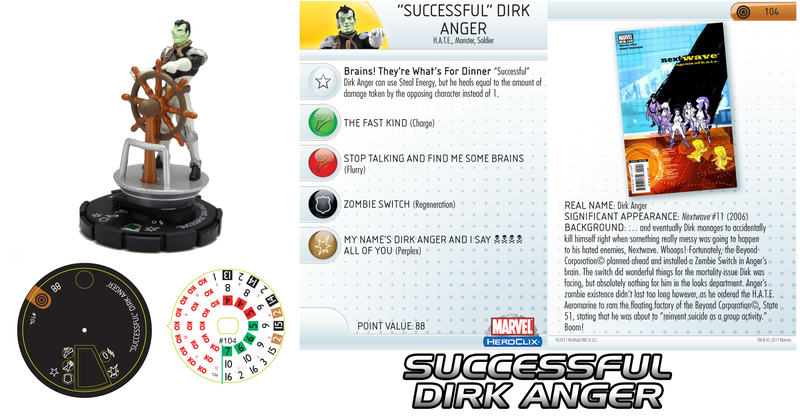 “Successful” Dirk Anger is every bit as interesting an addition to your force as his more lively counterpart. With his Brains! They’re What’s For Dinner! trait, Dirk has the potential to stay on the battleground well into the late-game! Steal Energy is always useful, and full-dial Steal Energy even moreso! But Steal Energy that also heals equal to the amount of damage dealt? Excellent! Mid- to late-dial Regenerate also helps Dirk stay in the action as he launches attack after attack on his foes in his search for brains (and possibly a new pink house dress). Front loaded Charge allows Dirk to get right in the action as you manuever him into a position best suited to satisfy his cranial cravings. Charge gives way to Flurry mid-dial as Dirk switches tactics and starts swinging wildly hoping to score some sweet, sweet grey matter, while a couple of clix of Perplex help Dirk confuddle his foes even further! We hope you’ve enjoyed our visit to the head office of H.A.T.E. Be sure to join us soon as we preview yet more additions to the Captain America article series! Until then, keep on clix’ing!